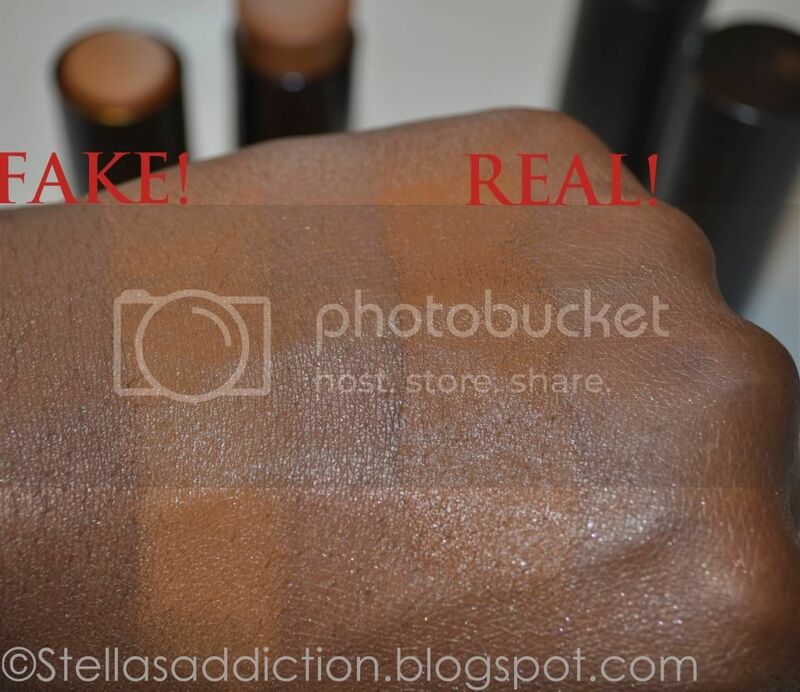 During a recent trip to the Lagos market to purchase Black Opal foundation I quickly realised the counterfeit version was indeed more common than the real thing! In a matter of minutes I became a pro at spotting the fake so of course I decide to share them. 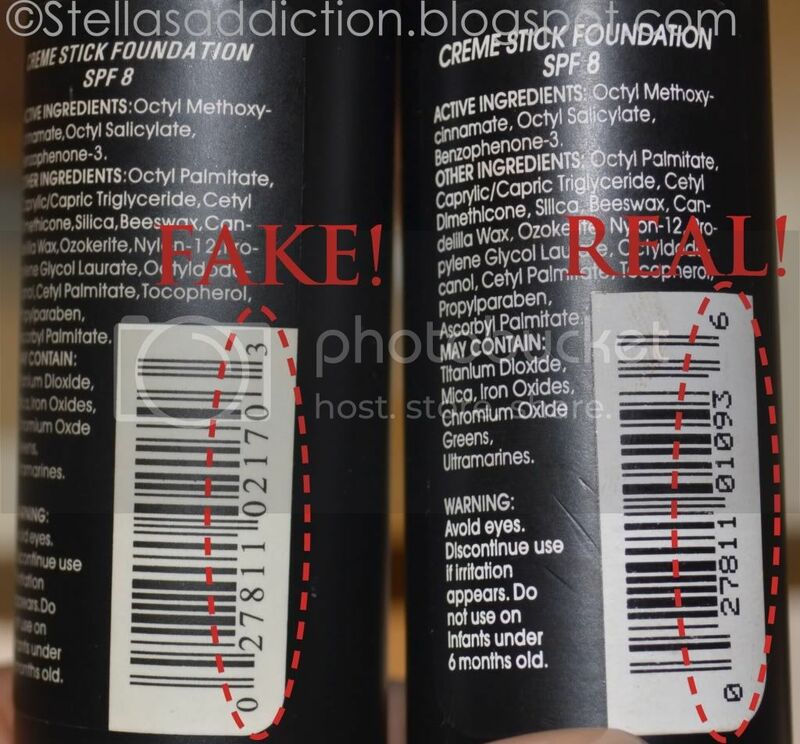 Here are some tips for spotting the fake. *It is important to note there are many versions of the fake so differences may differ. My tips are based on my observations on the versions I saw and the sample I purchased for the purpose if this comparison. On the label at the bottom there should be 3 figures; 2 letters and 1 number. There is a thick plastic ring around the sticker. There is a break in the thick ring and in the break is a dot. This is believe it or not the most consistent difference, none of the fakes I saw had the break AND the dot. 5. The shades are also quite different so if you have one real one you can use that as a guide. Both swatches are of "Beautiful Bronze"
6. Rolling up the product on the fake one, I noticed a squeaky sound of plastic grinding against plastic, the real thing does not do this. 7. If the price is too good to be true, it's because it's a fake! In Lagos the sticks retail for N1,300-N1,400 ( I got the fake one for just N800)on their official website it's $9.50 in Paris €10-12 anything less than this is not the real deal! There you have it, my tips for spotting fake Black Opal. As you can tell these are very tiny details that can easily be missed. The best tip I can give you is: KNOW YOUR SOURCE. 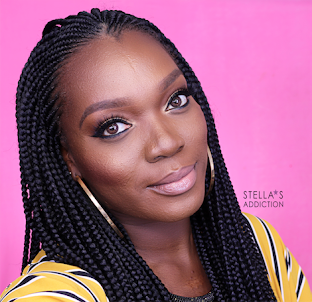 In the US you can order form the official Black Opal website, if you are outside the US check their site for their distributors in your country and in Nigeria look for Kuddy Cosmetics. When in doubt don't buy. Hope this helps! my first black opal foundation was a fake and i bought it for way higher than the real one (i bought it 1,800). i had sworn not to use it again until we had to use them in makeup school and thats how i discovered Kuddy. It could happen to anyone, trust me. I almost got the fake too, she already had all the shades out for me and everything but I had a gut feeling so I left. oh wow! great post! I would never know the difference! @ B.A Always a pleasure to be of service :-) and judging from what I saw in the market, I can totally believe it! 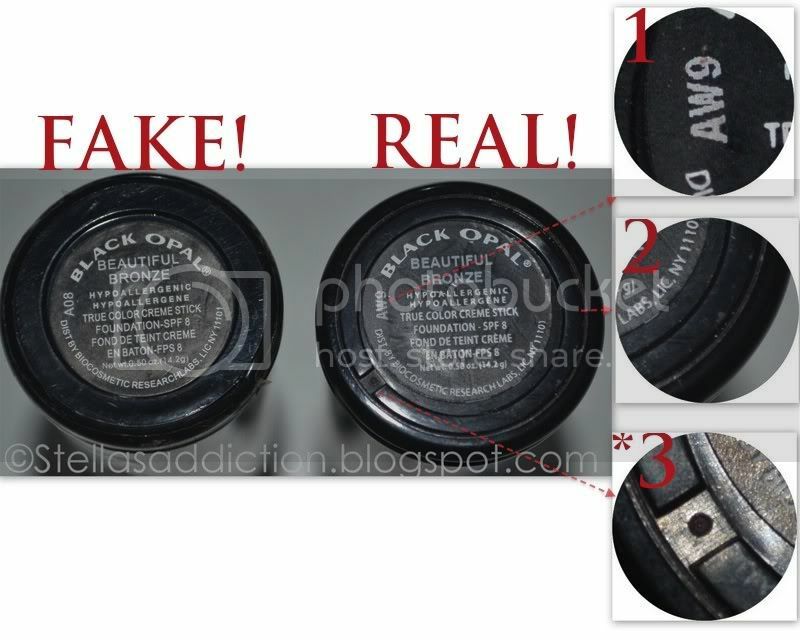 Ohmygoodness, they sell fake Black Opal over in Nigeria? I would have doubled over in laughter if I saw that in person. Over here in the US, it is like "cheap" drugstore makeup. Honestly it is not a bad line but MAC is queen over here. Personally I am not a fan of certain MAC products (i.e. their foundation since it leaves me with a grayish cast and it breaks me out something awful). I guess I will see it for myself once my mom successfully goads me into seeing fam in Abia State. 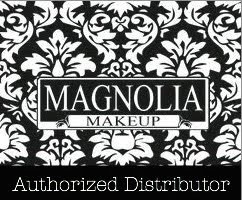 Hi .I love black opal products help me with the key to know the fake products. Some people know they are fakes but the price draws them. A couple of tests revealed mercury and arsenic in some fake brand cosmetics. It will be years before a lot are suffering from mercury poisoning and by then the cost of care will be way higher than the few bucks they are saving now..